Garmin has revealed three new variants of its Fenix GPS smartwatch today at CES 2017 in Las Vegas, meet the Fenix 5 range. Each new variant, entitled the Fenix 5, Fenix 5S and Fenix 5X, is based on a new, updated design that is thinner, lighter and more feature-packed. Of course, there are differences between the three models. The new Fenix 5 is thinner than the original (now 47mm) and features a more compact body, while still delivering the same functionality. The Fenix 5S is similar to the 5 however has been designed specifically with ladies in mind, with an even thinner design (42mm) partnered with a smaller watchface. There is a sub-devision of this variant, the Fenix 5S Sapphire, which naturally offers a scratch-resistant sapphire glass lens. Finally, the Fenix 5X is a tad chunkier than the Fenix 5 (51mm), but adds in even more functionality, with the smartwatch coming pre-loaded with topographic maps for the United States as well as configurable cycling and running maps also. Each new Fenix 5 smartwatch is water resistant down to 100 meters, while the battery life varies dependent on model. The new Fenix 5 can operate for roughly two weeks in smartwatch mode on a single charge and 24 hours when GPS tracking features are turned on. In contrast, the Fenix 5S, due to its smaller size, can only manage eight days in smartwatch mode and 13 hours using GPS features. Lastly, the Fenix 5X sits in between these two in terms of battery performance, with 12 days on offer in smartwatch mode and 20 hours of GPS functionality. 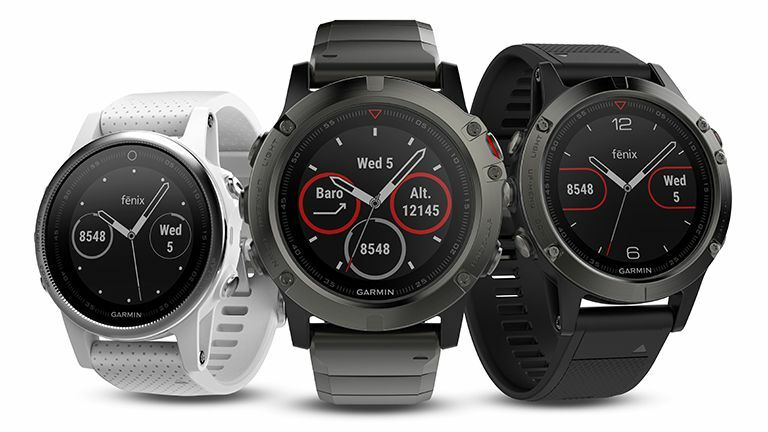 According to Garmin all three new versions of the Fenix 5 will be available in the first quarter of of 2017. The Fenix 5 and 5S will retail for $600 while the 5X will cost more at $700. More information is available about all three new Fenix 5 smartwatches at Garmin's official website.